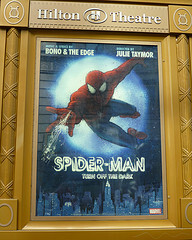 don't get caught: Spider Man syndrome: How long will an embargo hold? Spider Man syndrome: How long will an embargo hold? First seen and deplored by critics several months ago — when impatient journalists (including me) broke the media embargo for reviews as the show’s opening date kept sliding into a misty future — this singing comic book is no longer the ungodly, indecipherable mess it was in February. It’s just a bore. That's just the most high-profile case of an ever-shifting embargo with plenty of time for reporters to get resentful, bored and defiant, with a tendency to share those reactions in their coverage, to boot. But if you think that's reserved for the bright lights of Broadway, think again. The American Academy of Sleep Medicine embargoed news releases for its annual conference weeks ahead of the meeting, but made them freely available on its website at the same time. Embargo Watch blog highlighted the case, and has been successful at convincing other groups to stop making embargoed information freely available during the embargo period. But that still leaves the long wait time.